In November past, Brad Pitt & Angelina Jolie return to Vietnam four years after adopting Pax Thien. This is the first time Pax has been back to Vietnam since he was adopted, allegedly. 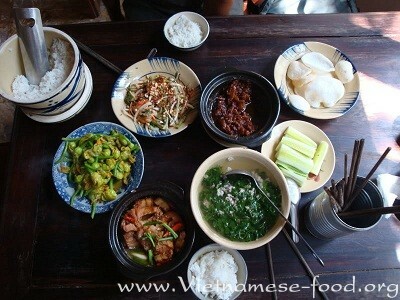 Anyway, the family was spotted eating traditional Vietnamese food…in Cuc Gach Quan restaurant. Angelina Jolie and Brad Pitt have deep impressions with staffs of restaurant. Before they left here, Angelina Jolie also had written a few line of her feelings about the meal. "Thanks for a great lunch. A beautiful space. 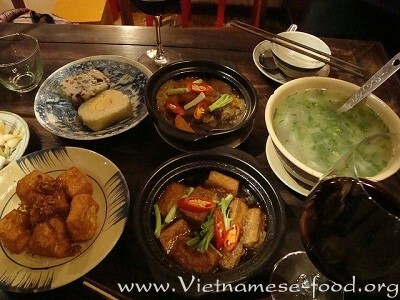 It has many dishes are delicious. We will come back here the next time, ." Underneath sentences , It is not only signed of Angelina Jolie but also signed of Brad Pitt and Pax Thien. So, I want to introduce to you somethings about this exciting restaurant. Addresss: 10 Dang Tat | Ward Tan Dinh, Ho Chi Minh City District 1, Vietnam. As a guest come here from far away, who sometime is welcomed from the airport to this strange restaurant. From the pink entrance with barbed wire to the fanciful and poetic space in the restaurant. when the guest come here , the restaurant treats them like close relatives,a meal is ordered without menu, the fresh food is bought at the market in the early morning , diners are feeling as they are visiting their house,not that they are on business. You will feel It is very nice to have a heartfelt friendship , and you will curious to know how create a familiar space of the restaurateur. You are going to gradually know about this interesting space, and all the people usually come here. Identified himself as "peasant ", but he is very confident when he said that his native soil created " A meeting place of creative people in Saigon ", Architect. 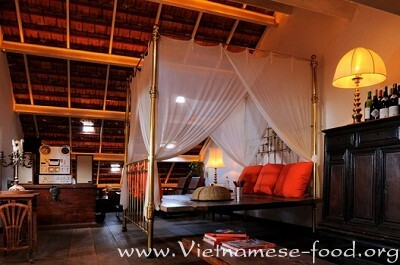 Tran Binh - is the young owner of Cuc Gach restaurant - also strange as the way he created this space. He created not only his private space but also in all his designs are "luxurious" and "rustic". Put - place - arrange everything in the right place, but It still has absolute respect the habits and personalities of people who use them. The architects have changed normal thought about connection of objects in the space. Many his works is pleased results of homeowner and designer, so Tran Binh is assessed that he constructed not only house but also family habit. You know thoroughly daily work of the restaurateur, so that you will understand why Cuc Gach restaurant is becoming attractiveness with many peoples. A journalist comes from Japan, she has came here the first time ,then she came back home quickly,took a pen and paper , she designed her home again ,she imagined and outlined until the next morning. 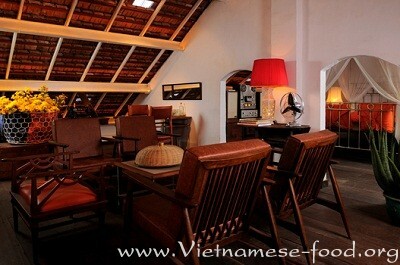 Cuc Gach restaurant is situated on the ground floor of a old house. Right here, a small space is familiar and curious. Restaurant have many small corners ,the space is both quiet and slow to such an extent that the people is ready to lie down, they have half-closed eyes from sleepiness to enjoy popular songs of the 1970s, by excellent singers such as: Khanh Ly, Thai Thanh, Le Thi ... A kitchen zone is very rustic with some piles of bowls and plates made from porcelain and a set of old dining-table . Everything in the restaurant are used properly like peasants usually patchy objects. We were surprised at toilet and wash basin because they are made from a stone mortar . Visitors come to eat here and most of them are familiar friends .they come here like they have dinner at their close friend's house. 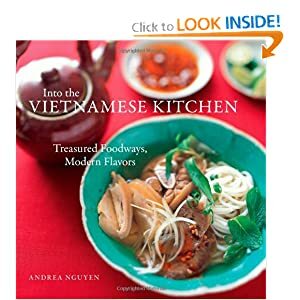 Popular foods are foods of the South with four criteria such as: "salty-fry-soup-vegetable".Drinks are things which can not easily forget of the countryside such as : black beans soup, loan soup,.. But sometimes, this place is space of the important event. At that time, all the colors of the room is changed to suit the space and the nature of this event. It's a magic space.